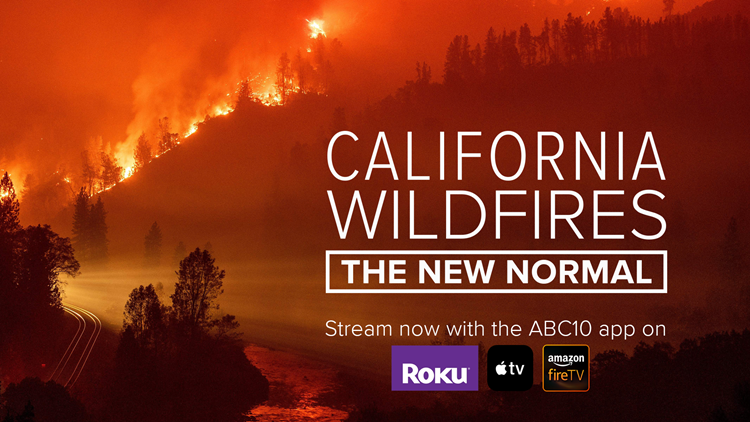 ABC10's special California Wildfires: The New Normal is available on OTT platforms. From escaping the Camp Fire in Paradise, to the aftermath of the Carr Fire in Redding, to Santa Rosa rebuilding after the Tubbs Fire, ABC10's Originals team is taking a personal and deep look at California's wildfires. "California Wildfires: The New Normal" series airs this week on LNT at 11 p.m., is available here or streaming on Amazon Fire, Roku and Apple TV anytime. When the Camp Fire ignited, it started a chain of events that not many would have predicted. UPDATE: 12/11/18— Authorities identified an 86th fatality who passed away in the hospital after receiving burn wounds in the fire. When the Camp Fire ignited, it started a chain of events that allowed it to become the deadliest wildfire in California history, claiming lives in the town of Paradise, California and the surrounding neighborhoods of Concow and Magalia on November 8, 2018. The fire forced the entire population to evacuate at once--an action emergency managers had actively avoided in their plans for handling wildfires. There was no plan to handle an evacuation on this scale. Some people became trapped, oblivious to the evacuation orders that had been issued for their homes. Many had no warning as some notification systems went unused and others failed to reach large groups of people. When disaster approaches, the body camera of first responders and eyewitness accounts are the best way to get an idea of what it's like to face a life-or-death situation. This past year has seen some of the largest, longest, most destructive wildfires in California history. Some survivors have described the approach of a wildfire as "Armageddon." In Coffey Park, a Santa Rosa neighborhood devastated by the 2017 Tubbs Fire, the reality of their situation came into focus very quickly. "A bunch of other neighbors came and were just standing in the middle of the street," Jeff Okrepkie, resident of Coffey Park, said. "One of our neighbors came running around the corner as fast as she could and she was like, 'It hopped the 101.' It was like a second of stunned silence, and then we just ran into our homes and started to evacuate." Body cam footage from local police, firefighters, and city buses tell tales of frantic evacuations, and show images of a hellish landscape of burning buildings and blowing embers. Even first responders were overwhelmed. Sonoma County Sheriff's Deputy Mark Aldridge found himself trapped with dozens of evacuees. "I told dispatch, 'I'm stuck. I've got three dozen people with us'," Aldridge said. The fire came within 100 yards of where he and the others were forced to wait it out and hope for the best. Over a year later, Aldridge still feels the effect of that chaotic night. "There's been times I walk outside, and I get nervous, but you shake it off and go to work," Aldridge said. "It was definitely something I don't want to do again. Once in a lifetime is enough." A cafe owner steps in to help when a Redding man faces an unspeakable tragedy during the Carr Fire. This story is about a friendship — one forged by loss and flames. Ed Bledsoe was racing home to evacuate his wife, Melody, and great-grandchildren James and Emily as the Carr Fire bore down on their Redding home. Ed was on the phone with them as he made the harrowing ride. He remembers James telling him, "'Grandpa, come to the front door because the back door is on fire and I don’t want you to get hurt." But, Ed didn't reach his home in time, and was on the phone with his great-grandson until the end, telling him how much he loved him. Said Bledsoe, "I talked to him until he lost his last breath." Redding restaurateur John Dix heard of Ed's family tragedy while on vacation in Ireland, and immediately hopped on a plane to help a man he'd never met. Dix said he kept pulling over to cry on the drive home from the airport. John contacted Ed and they arranged to meet in person. "I keep thinking, 'What am I going to say? What am I going to say?' And he keeps looking at me like 'I don’t know what to say,' and we just start crying,” said John. John has been there to support Ed in his grief, ever since. Jeff Frost is a time-lapse, wildfire photographer. He documents the progression of fire with his camera and creates high speed films. If a picture is worth a thousand words, Jeff Frost has photographed a library on California wildfire. For the past five years, he's been documenting California’s biggest fires. When Frost changes the shutter speed or the exposure, the complexities of wildfire come into focused. "Of course fire is complicated," Frost said, who made a full-length film out of his time-lapse's. "Its not just climate change its forest management and a lot of other things." When you look at fire through an artist’s lens, you get another perspective. Frost spends several day on his own and working alongside fire crews. He even went through fire training so he would know how fire acts. Frost want to show people the images and help them arrive at their own conclusion about wildfires. "If you can show a time-lapse of a fire and see it super-fast, I mean, anytime you can show people something in a way they are not used to seeing them, there is always an impact," Frost said. Telling a story about a wildfire is complex and takes time to tell. Frost's images tell one side of wildfires but, tangible objects hold a story of their own. As part of his art exhibit, Frost collects burned artifacts from the fire. Melted metal, burned toys and chard wood help tell the loss that takes place in a fire. "I only take these items with permission from the owner," Frost said. "Often times, the homeowner will tell me a story about an object and that gives that object meaning. That's something I want to share with others." The Navy has SEAL Team Six. The Army, Delta Force. But in the world of firefighting, hotshots are the tip of the spear. California’s wildfires are growing more powerful, more unpredictable, and more deadly. They’re also growing more demanding, both to those trying to find out the reasons behind their intensifying nature, and those who are tasked with stopping them. Interagency Hotshot Crews are concerned with the latter, and they’re often sent to the most dangerous and technical parts of these “megafires” where their elite training and qualifications allow them to combat the flames in front of them with little to use save the hand tools they’re able to carry with them. As these types of wildfires become more frequent, burning longer and hotter than they ever have before, ABC10’s Michael Anthony Adams spent time with the men and women who are standing toe-to-toe with the flames — who are sacrificing their lives to make sure those in the fire’s path have a chance to survive. The Carr Fire hit home for the Redding Fire Department when it killed Jeremy Stoke. His colleagues have found their greatest source of support and strength in each other, and by keeping his memory alive. Redding Firefighter Grayson Hartman and Captain Chris Smith battled on the front lines of the Carr Fire. They were out there, putting their lives on the line, even as their own homes were at risk. “We had three guys lose their homes, and a third of our department that was evacuated for the week,” Smith said. They fought on, regardless. Then they heard the news that made time stand still. “We got word about Jeremy and then everything changed after that,” Smith said. Jeremy, of course, was Jeremy Stoke, the Redding fire inspector who died when he was trapped by the fire while trying to evacuate his fellow residents. "Honestly, we are still recovering," Smith said." "I don’t think this is something we recover from overnight." “We are going through this with the community too, grieving losses and destruction as well, so that support is reciprocal too,” Hartman said. "We just keep getting up in the morning and coming to work. Maybe someday it won’t seem as painful as it was or has been in the last couple months. We can hope." When it comes to covering wildfires, "Adventure" Dan goes where others can't to keep evacuees informed, until they can get home. There are few obstacles that Dan Ryant's four-wheel drive Jeep can't get through. The people who call on him for help often live in rural or remote areas. Ryant is a fire chaser and he works from the road. The Red Bluff man uses Facebook Live to show evacuated people what their homes look like after fire passes. "One of the worst things for someone who was evacuated from their homes is not knowing if they have a home to go home to. Not knowing if they need to make plans," says Ryant. Ryant is an independent journalist who gets special access into evacuated areas. In many cases, his videos were the only way for evacuees of the Delta Fire to see if their home was still standing or not. Dan's goal is to help people move on or make plans when the fire evacuation is lifted. Even with insurance, the road to recovery from losing everything to a wildfire can be a long one. Over a year later, residents of the Coffey Park neighborhood in Santa Rosa are still fighting to rebuild their lives. Dave Edney, a Sonoma County sheriff’s deputy, and his wife Mellissa lost their home in the Tubbs Fire last fall. Coffey Park, their neighborhood, was one of the areas hardest hit by the fire that destroyed a total of 3,000 homes in the city of Santa Rosa. A year later, only a few dozen homes have been finished, with thousands still going through the intricate permitting process. Mellissa didn't think her family would return and rebuild in Coffey Park. “I had a bit of PTSD and just couldn't see ourselves coming back here with the trauma that we had experienced.," Mellissa said. The Edney's searched a 20-mile radius and could not find homes they could afford with the funds they received from their insurance. Besides a seven-month long battle with a contractor, getting those funds from their insurance, Mellissa said, was the hardest part. California’s leaders tell us we’ve entered a “new normal” of more intense wildfires. The truth is: Experts think the deadly "megafires" we’ve seen are just a preview of the new normal. California's leaders are promoting the idea that the state is in a "new normal" of more extreme wildfire, but fire scientists say it doesn't have to stay that way, even in the face of a climate that's getting warmer. The solution experts are presenting to the state's leaders amounts to a vast landscaping project stretching across tens of millions of acres of forest, cleaning out overgrown vegetation that's accumulated over a century because it wasn't allowed to burn. "I’m very much an environmentalist, but at the same time we have to get away from just sort of the tree-hugging mentality," said researcher Hugh Safford. "You have to look at the whole. It’s the classic not seeing the forest for the trees." Safford is the U.S. Forest Service ecologist for all of California and a leading researcher on how our forests work. He's trying to raise awareness of the fact that fire science is pointing to a paradox: To save California's forests, we'll need to let them burn more. "I think it’s existential," Safford said in the long term. "I really do. The solution won’t be easy and it won’t be popular: fire experts are pushing to thin or burn as much as 500,000 acres of California’s forests every year. That’s an area larger than the city limits of Los Angeles, San Jose, and Sacramento — combined. ABC10 Originals presents a 10-part series, California Wildfires: The New Normal. Liz Kreutz, Madison Meyer, John Bartell, Michael Anthony Adams, Lilia Luciano, and Brandon Rittiman take you inside wildfire coverage and tell us why these stories are personal. To view on your TV, find the ABC10 app on Amazon Fire App, Apple TV, or Roku. To view on YouTube, find our "California Wildfires: The New Normal" playlist HERE.